A Delta plan at LaGuardia Airport after running into a snow bank on a taxiway. 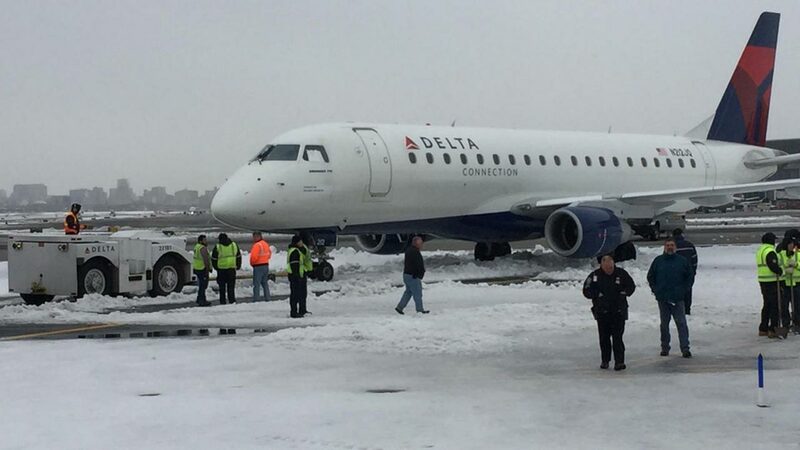 NEW YORK (WLS) -- A Delta plane flying from Chicago ran into a snowbank Saturday morning at LaGuardia Airport in New York City. Delta Flight 5964 landed safely on the runway, but when the pilot turned onto the taxiway, he ran into a snowbank after failing to properly negotiate the turn, a spokesperson for the Port Authority of New York and New Jersey said. The plane, which was carrying 77 passengers, remained there for about 30 minutes until moving to a terminal where the passengers were unloaded, the Port Authority spokesperson said. "The ground crew quickly assisted in clearing the snow, and the aircraft then taxied to the gate on its own power. The safety of our customers and crew members is our top priority," a Delta Airlines spokesperson said.